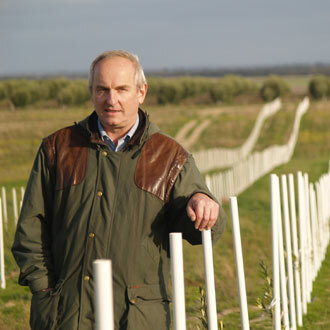 In the ten years that Paul Miller has served as President of the Australian Olive Association, his country’s olive oil industry has seen extraordinary growth. From 2001 to 2010, production expanded from 500 to 18,000 tons. And throughout the decade, growth has been supported by a strong push to ensure a reputation for quality. From the AOA’s recent establishment of a “Code of Practice” to the landmark approval this week of the new Australian Standard, Miller has led the charge for quality and authenticity right along with the burgeoning production volume. While credit must be given to the many producing members of the AOA, Miller’s background as an agricultural scientist, complemented by his uncanny business acumen, has helped the AOA take a solid footing onto the world stage. Following the headline-grabbing news about the new standard, we got a chance to find out what’s on Miller’s mind and what’s next on his horizon. I am an agricultural scientist. I did a major research project for the Victorian government in the mid-1990s on the potential for olive oil as an industry for the northern part of that state. That led me to be asked to work for several new developing olive businesses either as a technical director or consultant. Right now, it is the below-cost price of olive oil. Directly related to the price problem, the biggest challenge is to make sure that what is in the market is authentic. Studies in many countries both around the Mediterranean and around the world have shown problems with olive oil authenticity when it is offered for sale to consumers. Another challenge is providing proper classifications for olive oil, whether it is Extra Virgin, Refined, or a clearly-labeled blend of both (some countries may need to include Virgin where consumers are used to that grade as well). I am not alone in this – we are closely studying the research at the University of Jaen and other institutions, such as UC Davis as well as our own consumer research. The challenge will be to change the culture amongst some traders and retailers and to reverse the state of denial amongst several institutions. I know that there is a lot of talk about needing to educate consumers and I agree that is an urgent priority too - but if the consumers discover that what they are buying is not what it should be or are confused or misled by labels and grades, then the education will be a wasted effort. What the olive industry needs to realize is that in a very short time consumers (and that includes all of us!) will want to swipe the code on a product label with their iPhone and be able to trace the oil back to where it came from to find out more about it and have proof of its quality. If they find a problem it will be easier and easier for them to publicly make complaints through social media and damage the market for us all. Quite rightly consumers (and that includes all of us!) expect the industry to be true to the image of olive oil as well as its history and its valued place amongst food. In short we need to collectively clean up the marketplace - and we need to do it fast. Both the product and the people. I have worked with a lot of products – apples, cherries, wine, peaches, chestnuts, tropical fruits - but olive oil is by far the most fascinating food I have ever dealt with. The people in this industry are remarkable perhaps because it offers so much variety including culinary, cultural and historical aspects alongside exciting leading edge technology. Many things, but particularly right now our focus has been to contribute to the completion of the Australian Standard for Olive Oils and Pomace Oils by Standards Australia. It has taken 9 years of work and research to get to this point. Now that the standard has been published, we will be working to make sure the supply chain takes advantage of it. Very hard to choose and I don’t take many vacations. Probably New Zealand and specifically Tauranga Taupo for the fishing. Integrity plus a sense of humor. Two pairings. Fresh tomatoes from the garden plus Tasmanian salmon on really good toasted grainy bread and fresh extra virgin olive oil generously poured over the top or T bone steak medium rare rubbed with olive oil plus extra virgin olive oil mashed potato like the Greeks do it. Apart from my great kids, I guess it has to be sticking at being President of the AOA for ten years, making the international connections including AOCS, EFL and COOC, watching the olive industry evolve and trying to make a contribution to its future. Tough call in this industry. I have been lucky to have many excellent meals in many countries with many fabulous people. Perhaps on a particular birthday in 2006 when I had a Chinese banquet with a rare mixture of family and non-olive and olive friends that was preceded by drinks in the Cricketer’s Bar at the Windsor where we were privileged to watch Adam Gilchrist on the big screen make a ton in 57 balls against the Poms at the WACA start to finish. I would love to be able to help put olive oil back in its rightful place in the world food scene, especially in the ‘new world’ countries for olive oil. The market is horrible at the moment and we are in serious danger of losing a lot of good businesses and opportunities. I am however encouraged by the positive effects of what the recent improved policing of authenticity has had on demand and prices in Italy; I think this proves what can happen if structural defects in the market are fixed.